If you've never cooked with a purple sweet potato before (sometimes mistakenly called a purple yam), the first time you cut one open will probably cause you to gasp. The inside is beautiful with its light purple and juicy flesh in complete contrast to its dull brown exterior. The deep color of purple sweet potatoes comes from anthocyanins, the same pigment that gives cherries, strawberries, purple carrots, and other vegetables their color. Sweet potatoes that have brown, red-orange, or white skin with orange or white flesh are native to Colombia and southern Central America. After Columbus' discoveries, they were brought to Asia, and varieties with white skin and speckled pale purple flesh were developed on the Japanese island of Okinawa. Today, they are widely grown in Hawaii and exported to the United States mainland where they are popular with Asian and Latino communities. 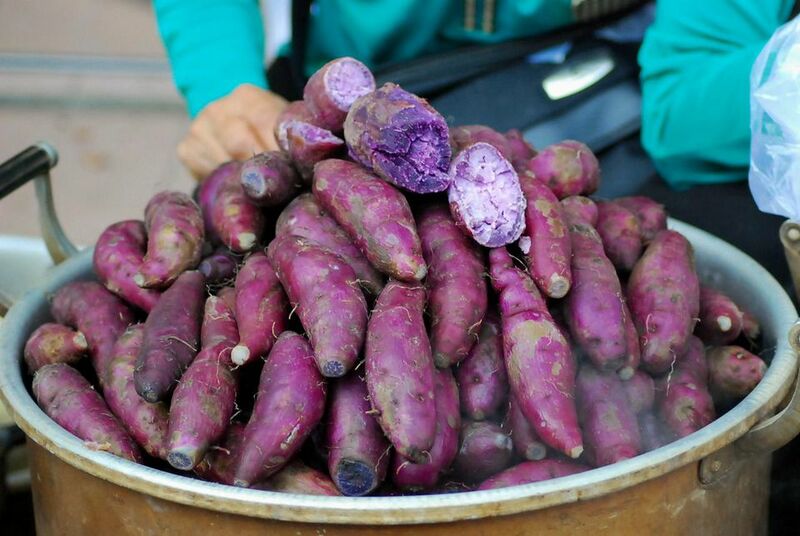 The purple Okinawan sweet potato is grown underground and is similar to Western sweet potatoes. From the outside, this purple sweet potato looks the same as an orange one but cut one open and you'll know the difference. They can be found across North America at an Asian or Chinese market, and even at some regular grocery store chains. Look for it in the fall and winter. Filipino ube or ubi (not usually available in the United States) have darker, rougher-looking skin and are yams, not sweet potatoes. They grow on a vine above the ground. This vegetable is a major crop and food source in the Philippines. It also is made into a powder which is then used in Filipino desserts (you'll know them by their bright purple color). Purple sweet potatoes have a rich, almost winey flavor but are denser and drier than regular sweet potatoes. When cooking, they will take longer than regular sweet potatoes. It will take anywhere from 90 minutes to 2 hours at 350 F to make them pleasingly moist. Purple sweet potatoes are wonderful boiled, steamed, or baked alongside regular sweet potatoes. They can be used in many of the same ways you’d use a regular orange or white potato, and the colorful result puts a fun spin on mashed potatoes, fries, and soups! The same anthocyanins that make food look pretty are touted to also have beneficial health effects—eradicating free radicals that have been attributed to causing cancer, protecting the liver, and lowering blood pressure. They are also high in potassium, B6, vitamin C, fiber, and antioxidants. Purple sweet potatoes are truly a natural wonder!